Buy 6 or more of any ONE of the Flipper Magnet Aquarium Cleaners and receive a 5% discount. Buy 12 or more of any ONE of the Flipper Magnet Aquarium Cleaners and receive a 10% discount. The Flipper Nano can be used on glass tanks up to 6mm (1/4") thickness or about 25 Gallons. Flipper's patented design creates the only 2 in 1 aquarium cleaner that can FLIP from scrubber to scraper simply by rotating the handle. Complete cleaning without ever getting your hands wet. Made with rare earth magnets for incredible cleaning strength and durability. Cleans even the most stubborn coralline algae. The Flipper Standard can be used on glass and acrylic tanks up to 12mm (1/2") thickness. Flipper's patented design creates the only 2 in 1 aquarium cleaner that can FLIP from scrubber to scraper simply by rotating the handle. Complete cleaning without ever getting your hands wet. Includes a stainless steel blade for glass tanks and an ABS plastic blade for acrylic tanks. It is suggested to replace blades every 3-6 months to maintain optimal algae scraping. Unique orienting buoyancy always keeps the magnets facing the glass/acrylic for easy retrieval. Plus, Flipper is nearly neutral buoyancy so it does not sink like a stone if the magnets are disengaged. It is recommended you replace the Blades every 2 to 5 months. The Flipper Max can be used on glass and acrylic tanks up to 24mm (1") thickness. Flipper's patented design creates the only 2 in 1 aquarium cleaner that can FLIP from scrubber to scraper simply by rotating the handle. Complete cleaning without ever getting your hands wet. Replacement stainless steel blades for the Flipper Nano Magnet Aquarium Algae Cleaner. 2 pack. It is suggested to replace blades every 3-6 months to maintain optimal algae scraping. Replacement plastic blades for the Flipper Standard Magnet Aquarium Algae Cleaner. 3 pack. It is suggested to replace blades every 3-6 months to maintain optimal algae scraping. Replacement stainless steel blades for the Flipper Standard Magnet Aquarium Algae Cleaner. 2 pack. It is suggested to replace blades every 3-6 months to maintain optimal algae scraping. 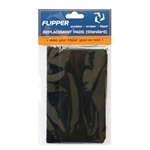 Replacement pads for the Flipper Standard Magnet Aquarium Algae Cleaner. Includes two dry side handle felt replacements and one wet side scrubber replacement pad with adhesive backing. Replacement pads for the Flipper Max Magnet Aquarium Algae Cleaner. Includes two dry side handle felt replacements and one wet side scrubber replacement pad with adhesive backing. Replacement plastic blades for the Flipper Max Magnet Aquarium Algae Cleaner. 3 pack. It is suggested to replace blades every 3-6 months to maintain optimal algae scraping. Replacement stainless steel blades for the Flipper Max Magnet Aquarium Algae Cleaner. 2 pack. It is suggested to replace blades every 3-6 months to maintain optimal algae scraping.